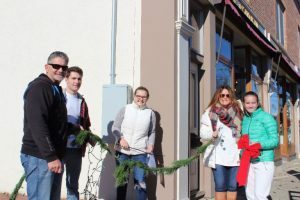 Most volunteers decorate between 11 a.m. and 1 p.m. There is no cost to decorate a lamppost. All materials are provided, you just need to bring a ladder. 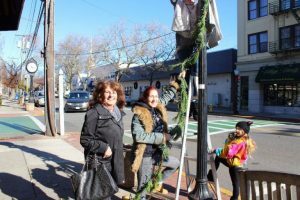 Each year over 1,000 people volunteer to decorate the lampposts throughout Babylon Village. 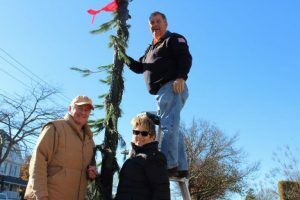 The Babylon Beautification Society provides all of the decorations (tree roping, lights, red bow) and volunteers sign-up in advance to decorate a lamppost. There is no cost to decorate a lamppost. 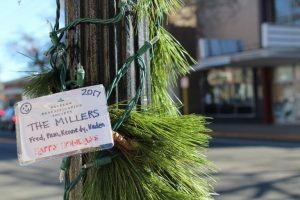 Each lamppost is assigned and volunteers are notified of a location to pick-up their decorations. 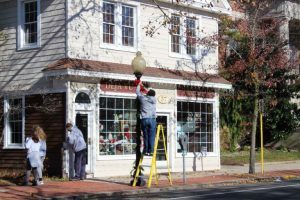 Volunteers are required to provide their own ladder to decorate their assigned lamppost. Within a few hours Babylon Village is transformed into a holiday wonderland for all to enjoy. Advance sign-up is required each year even if you signed-up and decorated a lamppost in a prior year. Note: you must sign-up using the web form below (opens September 2019). There are 500 lampposts and we will fill-up fast. We allocate the lampposts based on your sign-up date so we recommend that complete the form once it opens. 1. Sign-up using the form below. We will not take any sign-up requests via email. 2. Each person/family will be allocated only one lamppost per request. Requests for more than one lamppost will not be granted. Please do not sign-up more than once. 3. If you have extended family members or a group of friends who want their own lamppost they must sign-up separately. Our automated system requires a different name and email address for each request. 4. If you wish to decorate a specific lamppost please note it. Include the exact location of the lamppost – the street name, the side of street and where it’s located (i.e. Deer Park Avenue, west side, in front of Torta Fina). Please be very specific. Include the nearest cross street or street address if known. Please do not state “same as last year” since won’t cross reference to prior year’s lists. 5. If you wish to decorate next to other families/friends, please also note in the form. 6. 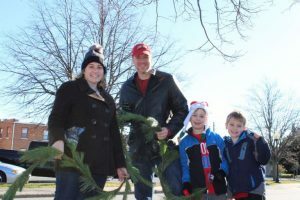 Volunteers may only decorate lampposts on Sunday, December 1, from 9 am to 4 pm. 7. We’d like to accommodate as many people as we can so we ask that you finish decorating by 1 p.m. if possible. 8. All volunteers who sign-up will be contacted in November. You must again confirm your participation and at that time you will be notified of your meeting time and location. We ask that you reply to us as quickly as possible. We are all volunteers and we are trying to accommodate as many requests as possible. Your promptness helps this process greatly. 9. IMPORTANT: After submitting your request you will receive an automated email confirming your online submission. If you don’t get the email confirmation your submission has not been received so either try again or contact us immediately via email. We are not responsible for submissions not received. Be sure to check your spam/junk folders and add our email address (info@babylonbeautification.org) to your safe-sender list to ensure you receive all of our communications. Note regarding requests: we will try to accommodate all requests but we can’t guarantee all will be granted. Some volunteers will not get the location requested. Location requests are allocated based on when we receive your submission, not based on where you decorated in prior years. If you do not get a specific lamppost we ask that you remember this is about community and volunteerism, not the location of a lamppost. We greatly appreciate your advance cooperation. Thank you for volunteering. The Babylon Beautification Society is a non-profit organization founded in 1971. Our mission is to support projects and initiatives that contribute to the beauty and history of Babylon Village. We work closely with local government and community leaders, as well as hundreds of volunteers to complete our mission. All donations received and funds raised go toward our mission. Your membership contributions and donations help fund projects like these. Annual membership is open to both individuals/families as well as merchants/firms located both in and outside of Babylon Village. To make a donation or become a member/renew your membership, click here.